Tulsa shooting, Bahamas vacation: Robert Bates trip approved after not guilty plea. 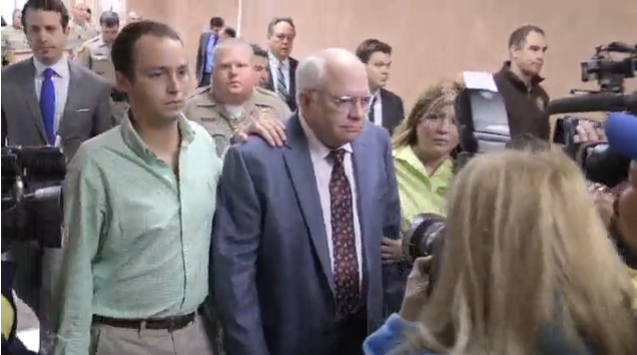 Robert Bates arrives in court Tuesday. Robert Bates, the 73-year-old Tulsa sheriff’s department patron and volunteer deputy who shot suspect Eric Harris to death on April 2, pleaded not guilty of second-degree manslaughter Tuesday and was given permission by a judge to take a vacation to the Bahamas. (Bates has said he shot Harris by mistake while attempting to use a Taser.) Attorney Clark Brewster “told the judge Bates’ vacation had been planned for months,” the AP reports. * Bates’ next scheduled court appearance is July 2. The Tulsa World reported this week that Bates, who has donated five vehicles (as well as other equipment) to the sheriff’s department, did not complete the training and certification programs required to become a volunteer or “reserve” deputy. The sheriff’s department denies the allegations. Harris was shot after attempting to flee from police during a sting operation in which he allegedly attempted to sell a stolen firearm to undercover officers. *Correction, April 22, 2015: This post orignally misstated that Clark Brewster’s comments were reported by a news station called KSN. They were reported by the AP.